Imagine reading the first edition of Dawson's Acadian Geology (1855), your life forever changed with the curiosity to learn more about geology of Nova Scotia. Imagine the excitement and challenges of organizing the Nova Scotia exhibits at the International Exhibitions in London (1862) and Paris (1867). 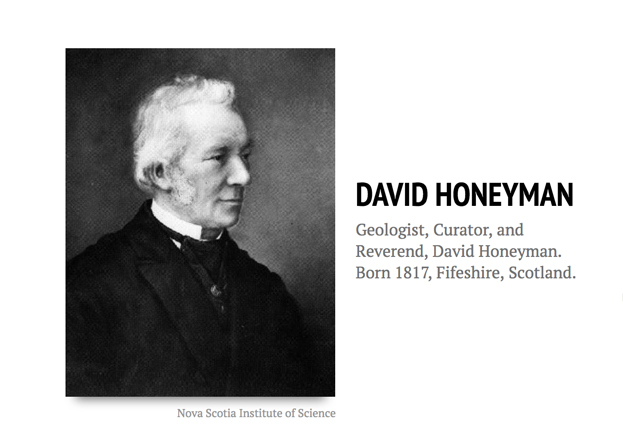 Did you know that David Honeyman was the first Professor of Geology of Dalhousie University? As we continue #FindingHoneyman, we will be adding new material to the online Timeline. You can explore the current version below: Scroll through the event by clicking the arrows on the right and left of the timeline, or click on a specific event. Some events have links or online media to explore in more detail.